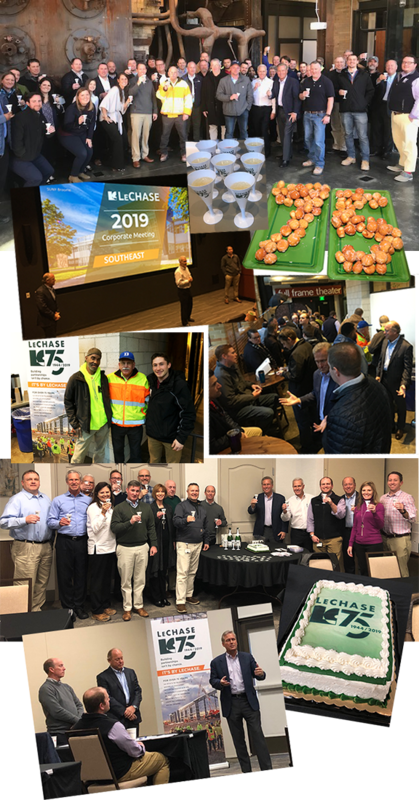 By Jeanne Eason February 1, 2019 Charlotte, N.C., Community, Durham, N.C.
Tuesday, January 22 was the final day of corporate meetings with LeChase southeast offices welcoming CEO Bill Goodrich and President Will Mack for the events. The Durham meeting kicked things off in the morning with dozens of local employees gathering at the Full Frame Theater on the American Tobacco Campus. Treats included cheese and grapes on “75th anniversary” skewers and a 75th-shaped donut cake – in celebration of the company’s 75th anniversary this year. Later that day, the celebration moved to the Piedmont Social House in Charlotte. A toast to the milestone anniversary was held to close both events.